I looked out the window today at the heart shaped path a friend had plowed for me the weekend before. The lake descending from my back yard now frozen was bare, except for my heart. I followed the long path from my knee deep snowed covered yard, leading to the shoreline. Then continued, stretching out to the corridor of plowed snow, several yards onto the lake. Alone in my thoughts I let my mind take me back in time. Back to the days when I myself shoveled paths throughout our back yard, before we moved to this lake. Days when shoveling was all that was required of me to allow my two youngest sons the capability to wander through the snow covered yard. Recalling the laughter and fun we shared together, I smiled to myself. Cody and Josiah would follow each other through the winding maze I created. Cautiously raising each foot at every step. Along the twisting isles they would stop and giggle at the snow creatures I sculpted for their delight. Then somewhere in the pathway they would find me collapsed. Laying, in the snow resting, from all the shoveling. Watching and waiting for them, filled with great joy that I was able to create for them a winter wonderland. Overwhelmed with hope that somehow walking would not be lost. Together, laughing we would tumble in the snow until our fingers and toes would begin to feel the slight sting from the cold. Looking out today where my friend had plowed, I realized getting my sons out on to the lake would be a task that I could not manage on my own. A mission, even if possible, that would most certainly require the enlisting of more help than just my sister Marie who has become my right hand lately. Scanning the lake and then back to the heart shaped trail, I wondered if my sons ever thought about those memories. The days when they were able to walk in the snow. The winters when going out doors merely required some assistance with dressing and help with maneuvering the stairs. The days when lifting was hardly a concern, a time when when the pathway seemed easier and more accessible. Moments when being a single parent did not seem to challenge my own physical strength so much. I knew Cody and Josiah remembered walking. It still was not all that long ago. We had just reminisced the day before, recalling memories of walking in the old house. we talked about the phase 2 PTC drug trial and the 6 minute walk test Josiah had no problem completing. A Beautiful visual of them out in the snow flashed before me. I envisioned the two of them walking as they had in the past following a groomed winter trail, smiling and walking. Winter had now become somewhat trying on us and often required more assistance than what I was able to provide alone, but we were managing. Only two weeks before we participated in our community out door Winter Fest. Trudging through snow with electric wheelchairs, bundled to soften the effects of a typical wind chill for Minnesota we went dog sledding and enjoyed a sleigh ride. With the help of family we were hardy Minnesotans enjoying winter. I stared at my carved heart. Its symbolic meaning calling to me. Today might not be the day I get my sons out on the lake to play in the snow. This most likely was not going to be the day I would see some actual difference that PTC was making in my sons lives. All the energy that caring for them demanded of me did not change. We would still have to prepare ourselves and face our fears of Josias' upcoming spinal fusion surgery. But, I was ready to give DMD another fight.I was ready to accept the new challenges that lay ahead. Most importantly, we had been given back an extra glimmer of hope. We were back on PTC. It looked promising. Cody and Josiah were tolerating the medication very well. We would embark on this next phase of our journey with DMD, hoping to be following the pathway to help cure Duchenne. Single mother of three sons. Zach 20 , Cody 17 and Josiah 13. My two youngest sons have Duchenne Muscular Dystrophy and a cognitive delay. I have spent the past six years rediscovering I am more than just mom. 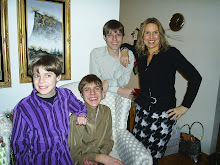 While I strive to find life after divorce, I also search to find the delicate balance in life that allows me to continue to care for and meet all the needs of my physically challenged sons. Each day I find my strength and courage in the love I have for my sons.